An mgoblog reader noticed something interesting on the MDen website this afternoon, which has since disappeared from the site. It's an image eerily similar to the leaked Free Press photo we saw last month that the athletic department (Brandon) quickly dismissed as not accurate. 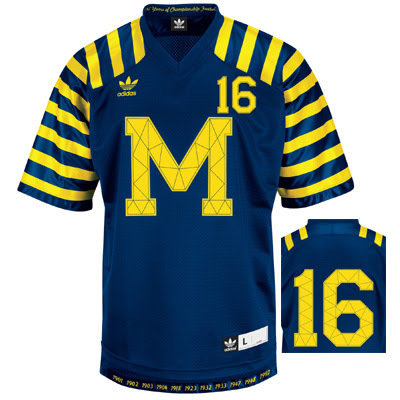 I will keep my opinion to myself until I see the official uniform this Friday night at an athletic department event being held at the Big House at 8PM (which will also be streamed live in mgoblue.com). 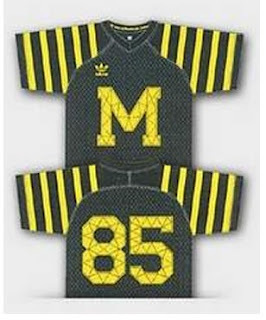 But the photo leaked by the MDen looks pretty darn real to me. And if this is the real deal, all I can say is...swing and a miss.